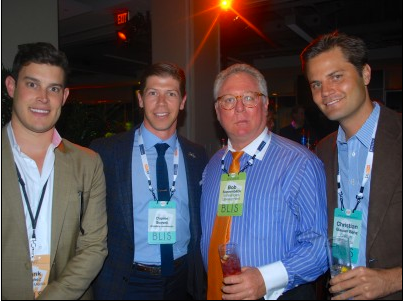 Here are some West Coasters: Bisnow director of Southern California operations Frank Sanchez, Woodbine Investment Corp’s Dupree Scovell, Sonnenblick Development founder Bob Sonnenblick (who also spoke), and Callison’s Christian Glauser Benz. Bob says his firm recently purchased 350 acres in Pinehurst, NC, where he hopes to break ground in January on a 330-room Westin hotel. He’s also talking with Tiger Woods Design about a golf course for the site.